The Upper Rio Grande area offers some of the best fishing in Colorado. Gold Medal waters on the river and an abundance of creeks, lakes, and reservoirs provide year-round opportunities for the avid fisherman! Online and in-person, check with knowledgeable outdoor shops, license vendors, fishing lodges, guides and outfitters. Fishing Licenses are required for people 16 years or older. Children under 16 don't need a license, and may take a full bag and possession limit. Possession Limit: is the maximum number of fish allowed in possession at any time. 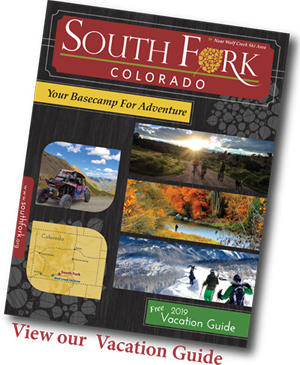 South Fork boasts the longest stretch of Gold Medal Waters in the entire state. Nearly 20 miles of the Rio Grande River receive this designation from the Colorado Division of Wildlife. These designations are given out sparingly and represent the highest quality aquatic habitat in Colorado - your best chance to catch a trophy trout! Gold Medal waters support recreational fishing, by keeping fish in the water and letting them grow to a larger size. Brown and rainbow trout fishing is good from the Rio Grande Reservoir downstream to Del Norte. The section of water between South Fork and Del Norte provides the best location for catching trophy brown trout. There are several access point for the Rio Grande, please consult state guide book, and observe all posted private property markers. When fishing any Gold Medal waters, be sure that you know what the possession limits for the area are and the type of fish allowed. 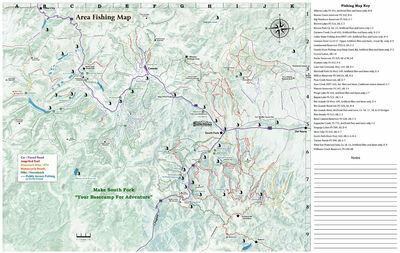 This information can be obtained through the Colorado Fishing Season Information printed, by the Colorado Division of Wildlife. The Rio Grande and its tributaries offer slow running waters, excellent for fly fishing as well as with lures. Many of the river’s smaller tributaries offer stream sized fish, and are abundant with aquatic life like cutthroat and rainbow trout. The most popular streams include: Embargo, Beaver, and Rock creeks. The South Fork of the Rio Grande offers good stream and bank fishing, wading, bait, cast and fly fishing for browns, rainbows, and brooks. It is accessible by car with some walk-in areas. Fishing Licenses are required for people 16 years or older. 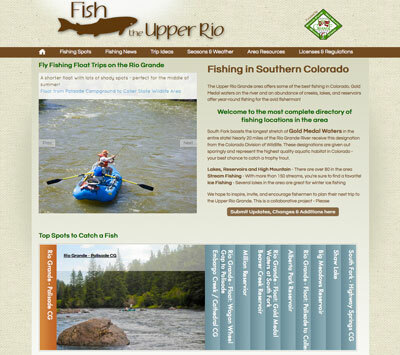 Visit www.fishtheupperrio.com for more info. There are over 80 in the area, 13 of which are 20 minutes from town. From high mountain lakes that require a lengthy hike, to nearby reservoirs accessible by any car and outfitted with boat ramps and handicap amenities, you are sure to find water suitable for your style. Elevation 8,700 ft. The 4 acres of water, offers a variety of Rainbow Trout, which are best caught on either bait, lures, or flies. The reservoir is located on the Beaver Creek Reservoir road, on the edge of South Fork and is then only about 5 miles, through some of the best site seeing forest the Rio Grande has to offer. Elevation 9,200 ft. 114 acres of water, with easy access for kids, and seniors, and is HANDICAPP-accessible. Big Meadows offers a variety of fish including rainbow and brook trout, salmon and German browns. They are all caught equally well with bait, lures, and flies. It is farther from town than the other reservoirs, at a distance of 18 miles, but the drive is well worth the fish found in its waters. Elevation 8,850 ft. 114 acres of water offers easy access for kids, seniors, and is HANDICAPPED accessible. Like Big Meadows there are various types of trout, browns, and salmon, found in its waters. Caught on any type of rig that you may want to use whether bait, lure or flies. This is one of the closest lakes to town, with exceptional fishing, with a drive time of only 15-20 minutes. The lake itself is approximately 8 miles outside of town, with a spectacular drive that warrants a slower drive time. This lake also offers exceptional winter ice fishing. Elevation 9,850 ft. 20 acres of water. This lake offers good trolling for cutthroats and brookies. All caught equally well on any type of lure. Facilities available at the lake includes a boat ramp, rest rooms, and is handicap accessible. Elevation 10,202 ft. Surrounded by grassy meadow and conifer forest. Fair for 10-12" rainbows and 8-12" brooks. Elevation 11,400 ft 8 acres of water. The fish can be slow to bite, but are available for the patient angler. However, fly fishing is good for rainbows. This lake requires a 1/2 mile hike from your car. Elevation 9,700 ft. With 4 acres of water. This is a great spot for amateur fishing, with good bait, and fly fishing for rainbows. This area is accessible by car and offers camping facilities, and picnic area. HANDICAPPED accessible to two docks and toilet facilities. This lake is also good for bait and fly fishing for rainbows. There is limited parking, with no other facilities but is winter accessible. Archuleta Lake - Elevation 11,720 ft. 4 acres of water. Is located in a wilderness area and is only accessible by horseback or hiking. It offers slow fishing for cutthroats, rainbows and brooks. Crystal Lake - Elevation 11,300 ft. approx. 9 acres of water in both the upper and lower lakes. Fishing is good for brookies, cutthroats, and rainbows at both locations. Crater Lake - Elevation 12,700 ft. The 10 acres of water is excellent for fly, cast and bait fishing. It is located on the west side of the Divide, and offers great trophy cutthroats and rainbows. Access is by 4-wheel drive or a difficult hike. Several lakes in the area are great for winter ice fishing. A few of our favorites include Beaver Creek Reservoir, Big Meadows Reservoir and Road Canyon Reservoir west of Creede. No river is more enjoyable to float and fly fish in summertime than the Rio Grande in Southern Colorado. The river begins in the alpine mountains above Creede, and flows through South Fork, then on to the flattening valley floor at Del Norte. Within this stretch lies one of the most underdeveloped, pristine rivers in all of the Southwest. 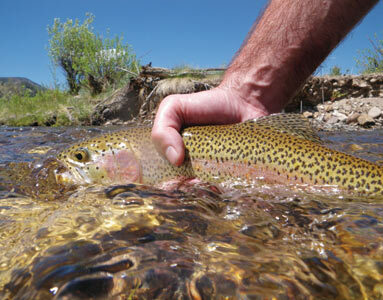 Both rainbows and browns abound, with many tributaries running into the Rio along the way. The South Fork/Creede area is the perfect destination for a first-time float trip. 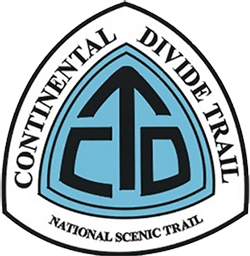 With the many guest ranches, bed and breakfasts, hotels, campgrounds and RV parks, there is lodging to suit any budget. Much of the area is designated National Forest or Wilderness land, so camping spots are everywhere. Fishing guru A.D. Dalton outlines some of our favorite floats. Included is the South Fork float. A good start to floating the river through South Fork is just past Masonic Park: a put-in for boats called Lower Coller. This is also a state designated Wildlife Area, so it’s likely you will catch a glimpse of a trophy elk or deer as they sip from the mighty Rio. This adventure takes you through all the good stuff! After putting in at Lower Coller (public access) you will immediately find yourself floating onto private land belonging to the Mason’s – view their “Masonic lodges” all along the Rio for about a mile. Strangely, this is the only spot on the Rio Grande where it is legal to keep a rainbow trout - you conspiracy buffs can do the research to figure out why! All I know is that you can keep four trout, rainbow or brown, in accordance with state regulations, from here to the Hwy 149 bridge. The river is wide through this stretch, and the fishing is good right after run-off for stripping streamers. This is also one of the last floatable sections when the water gets low toward the end of the summer. The float meanders through a few quaint neighborhoods of fishing cabins but mostly enjoys the quiet solitude of cottonwoods, aspens, spruce and pine trees dominating the mountain side. The Rio Grande Scenic Railroad runs along the river and the kids will enjoy waving to folks on board. 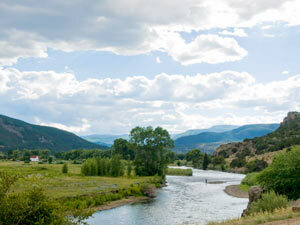 Further downstream you will float through Elk Creek Ranch (also private), before reaching town. Recognize it for the big grassy hay meadows that roll down the hillside to the river. 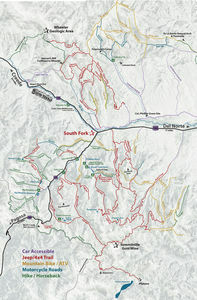 The hamlet of South Fork six miles down from the put-in is a oasis on the east side of the Continental Divide. Should you need a latte from the Feelin Good Cafe or a beer at the Shaft Bar this town will accommodate! As you float under the Hwy 149 bridge, you are officially in Gold Medal Waters. (See current fishing regulations for Gold Medal Waters, typically two browns over 16 inches and all rainbows returned to the river). Floating through downtown takes you past the beautiful Rio Grande Club and Golf Course, with some of Rio Grande County’s most luxurious stay-and-play amenities. It’s in these waters that the BIG trout hang out – enjoying deep rock pools and slow-moving water. I know guys that get off work and float just from Hwy 149 bridge to the Lower Alpine take-out in the evening to cast a fly at these hogs. Big drys or drifting with nymphs -- either way its great fishing every time. The float ends at Franke Excavation/CR 19 with a small take-out located on the north side. I would also like to add that boats have always been able to put-in/take-out at the Hwy 149 bridge access, but signs have recently been put up for no trespassing, no parking ect. And the nearest parking is a long ways away. The access is still available, but because of the parking situation you can basically only get dropped off there. Although the put-ins and take outs are public property, much of the river along the way is private. Please be respectful so all can enjoy the beauty of the river.